The United Nations, naturally, disapproved. Pope Francis, more enigmatically, protested, too, when President Donald Trump recognized Jerusalem as the eternal capital of Israel. By 2019’s end, the Trump administration plans to open the American Embassy in Jerusalem. There's a reason Muslims living in Israel proper—1.5 million of them—don't migrate to the adjacent Palestinian Authority. They're better off in Israel. Should Jerusalem, East and West, be recognized formally as the capital of Israel only, under Jewish control alone; Christianity's holiest sites will be better off. Judaism's holy sites will be safer. And so will Islam's. Jerusalem is no settlement to be haggled over; it's the capital of the Jewish State. King David conquered it 1000 years Before Christ. The city's "Muslim Period" began only in the year 638 of the Common Era. "Yerushalaim," and not Al Quds, is the name of the city that was sacred to Jews for nearly two thousand years before Muhammad. Indeed, not once is Jerusalem mentioned in the Quran. And while Muhammad was said to have departed to the heavens from the Al Aksa Mosque, there was no mosque in Jerusalem. The Dome of the Rock and the Al Aksa Mosque were built upon the Jewish Temple Mount. Muslim theologians subsequently justified this usurpation by superimposing their own chronology—and relatively recent fondness for Jerusalem—upon the existing, ancient sanctity of the place to Jews. Essentially, this amounts to historical identity theft. It's bad enough that Bethlehem—the burial site of the matriarch Rachel, birthplace to King David and Jesus and site of the Church of the Nativity—is controlled by the Palestinians. But, as one wag wondered, "How would Christians react if Muslim theologians had chosen to appropriate the Church of the Holy Sepulcher, rename it and declare it Muslim property?" 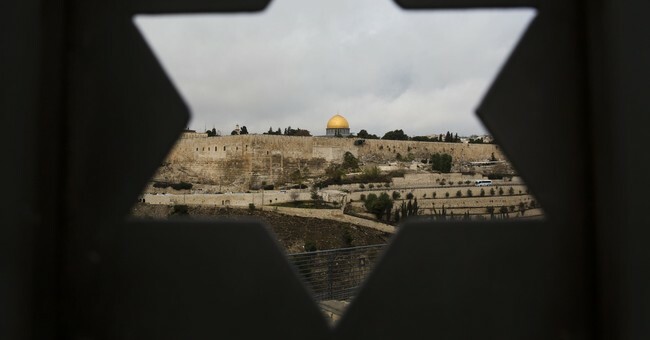 There is nothing Solomonic about splitting Jerusalem, which—it bears repeating—was sacred to Jews for nearly two millennia before Muhammad and is not in the Quran. "The Muslim Claim to Jerusalem," notes Dr. Daniel Pipes, is political, not religious or historic. As such, it's also a recent project. "Centuries of neglect came to an abrupt end after June 1967, when the Old City came under Israeli control," explains Pipes. "Palestinians [then] again made Jerusalem the centerpiece of their political program, [when, in fact] Mecca is the eternal city of Islam, the place from which non-Muslims are strictly forbidden. Very roughly speaking, [Mecca is to Islam] what Jerusalem is to Judaism." East Jerusalem was not annexed in June of 1967. Rather, Jerusalem was unified. Loose paraphrasing of U.N. resolution 242 requires Israel to give the Golan Heights to Syria (which is tantamount to returning land to the aggressors) and allow the Palestinians to establish a state capital in East Jerusalem. For their concessions, this "peace initiative" entitles Israelis to "an effective veto" on the national suicide pact known as the right of return: the imperative to absorb millions of self-styled Palestinian "refugees" into Israel proper. A quick quiz: What does "unoccupied" or "liberated" Palestinian land look like? Answer: Like Gaza. Gaza was "returned" to the Palestinians, who promptly destroyed the hothouses Israelis had built there, and planted in the ground Qassam rocket launchers, instead. Gaza now hothouses Hamasniks. In all, granting statehood to their nihilistic neighbors has been pretty thankless for Israelis. But what of Palestinian families who've resided in The City for generations? This the libertarian must address. A historical, national Jewish right to the city of Jerusalem does not extinguish the property rights of individual Arab homesteaders acquired over the years. Faith and the facts of history notwithstanding, Jerusalem undivided as the capital of the Jewish State is what Christians should be praying for if they value celebrating future Easter Holy Weeks in the Church of the Holy Sepulcher, located in Jerusalem's Old City. That was in 607 BC (Before Christ), and we Jews have still not forgotten.